Ralph Leonard Pipe was born in Paddington, London, in 1891. He was the son of grocer Edward William Pipe (1866-1915), originally from Yeovilton and his wife Emma Mary (b1865). Edward and Emma's other children were Cecil (b1895) and Elsie (b1900), both born in London. The family moved to Yeovil some time after 1901 and Ralph served a term of apprenticeship as a linotype operator on the staff of the Western Gazette. By the time of the 1911 census the family were living at 7 Camborne Street. Edward was the manager of an aerated water works in Yeovil. Ralph, however, had moved away from Yeovil and was working on the staff of the Sheffield Daily Telegraph. Edward Pipe died in Yeovil in the summer of 1915 and following his death Emma moved to 27 Crofton Park. Ralph enlisted in Sheffield in May 1915, becoming a Sapper in the 2nd/2nd (West Riding) Field Company, Royal Engineers (this was also known as 459th Field Company). His Service Number was 2617. The 459th had been formed in September 1914 when it was attached to 62nd Division. In October 1915 the Company moved to 6th Division. On 10 October 1915 Ralph went to France with his Company - the 6th Division had moved into the Ypres Salient to relieve troops that had fought in the Second Battle of Ypres. The Salient was relatively quiet for the rest of the year. Ralph, with his Company, spent the next few months enduring the day-to-day existence of trench warfare. On 2 March 1916 Ralph was killed by shellfire. He was aged 25. The Western Gazette, in its edition of 10 March 1916, reported "Another Yeovilian to fall in defence of his country’s honour is Sapper RL Pipe, the news of whose death at the Front on March 2nd, has been received by his widowed mother, who resides at 27 West Hendford. Although the deceased soldier has not been living in the town for some years past he will be well remembered. Having served a term of apprenticeship as a linotype operator on the staff of the 'Western Gazette' he removed to the north some six years ago, and at the time of the outbreak of war, was working on the staff of the 'Sheffield Daily Telegraph'. He relinquished a lucrative position to join the Army, in May last year and went to the Front six months later with the 2nd/2nd West Riding Field Company, RE. Deceased was in his 25th year, and his other brother is serving in the Navy. Letters detailing the circumstances attending Private Pipe’s death have been received by the bereaved mother. Writing on the day of his death, Second Lieutenant Hutson, one of the deceased’s officers says; “heavy shelling of our billet had just begun, and it was the third shell which killed your son. It was just after breakfast and he was washing himself at the time. He took what he thought was sufficient cover to ensure his safety, but, unfortunately the shell struck the ground near to him. I cannot tell you how much the officers and men feel his loss, for he was a good, quiet fellow, and a most reliable man, and he was also one of the best sappers and one I could put with confidence on any job. His loss is universally mourned by every member of his company, for they feel they have lost in every sense of the word, a good comrade." A similar letter has been received from Major Alan C Howard, the commanding officer." 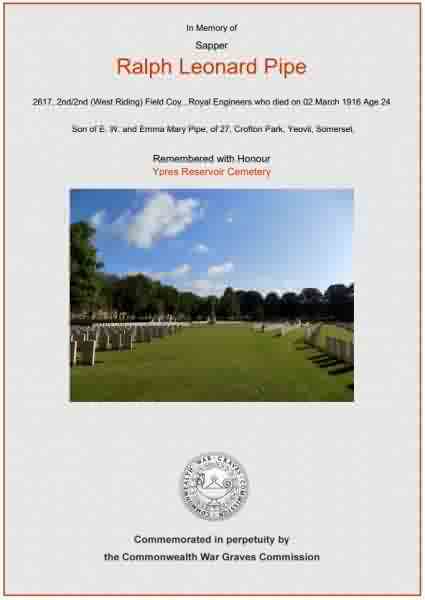 Ralph Pipe was interred at Ypres Reservoir Cemetery, West-Vlaanderen, Belgium - Grave I.B.28 and his name is on the Yeovil War Memorial in in the Borough. 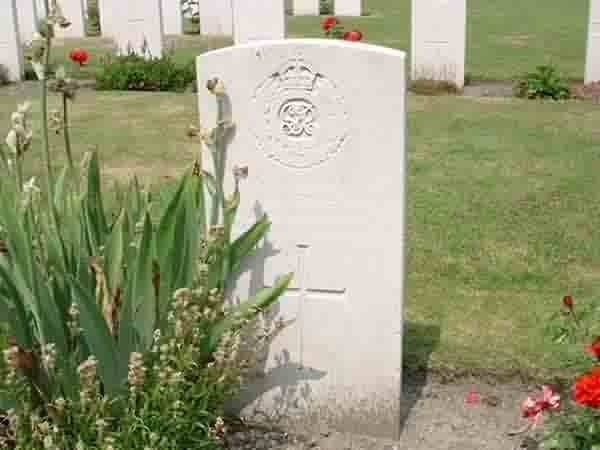 Ralph Pipe's CWGC headstone - Ypres Reservoir Cemetery, Grave I.B.28. The Commonwealth War Graves Commission certificate in memory of Ralph Pipe.